What do Carbon Motors' BMW-powered police car, Aptera Motors' electric three wheeler, and Fisker's luxury sedan have in common? Two things: they asked the government for loans, and they're dead, as are more than half of the car companies who sought loans, according to documents obtained via a Freedom of Information Act request by Jalopnik. Of the 18 existing or would-be carmakers we identified as having applied for loans under the U.S. Department of Energy's Advanced Technology Vehicle Manufacturing program, 10 have since faded into bankruptcy or ceased operations. Numerous car companies, startups and parts manufacturers have applied for the loans since the program was established during the Bush administration in 2008. However, most of them were turned down or simply did not receive the funds they requested. To date, about $8 billion has been doled out to just five carmakers: Tesla, Nissan, Ford, Fisker and the Vehicle Production Group. The last two have ceased production and appear headed toward bankruptcy. The goal of the ATVM program was to use taxpayer loan money to fund the next generation of American fuel efficient vehicles, whether they came from small startups or large established automakers, all while adding thousands of new jobs. Unfortunately, no new loan money has been handed out since 2011, a decision critics have alleged was done in the wake of failed government-backed solar panel manufacturer Solyndra. About $16 billion remains undistributed. Now, thanks to the highly politicized demise of Fisker, the ATVM program has been under a great deal of scrutiny. Fisker is on the hook for $192 million in taxpayer money, and a great deal of doubt has arisen as to whether they can repay that money. Since then, these questions have been on the minds of many Washington politicos, auto industry watchers and policy wonks: Has the ATVM program been successful, and does the government have any business playing the role of startup incubator in the first place? Since most of those companies were failures, you could argue it would have been foolish to gamble any taxpayer money on risky ventures that were ultimately doomed. The other way to argue it, as Gigaom's Katie Fehrenbacher put it recently, is to examine all the companies that didn't receive money. This may prove that they were instead being very cautious with who they funded, which is the conclusion The Truth About Cars' Ronnie Schreiber reached when he examined the issue. It doesn't seem like the Energy Department was handing out money to just anyone. Further, Tesla's strong streak as of late — including an announcement that they're paying back their loans nine years ahead of schedule — is hard to argue with. However, many of the car companies that failed blamed their demise on the failure to receive funds from the Energy Department. When Carbon Motors was denied the loan, their CEO, William Santana Li, said that they spent years in the due diligence process with the government and were under the impression that they would get the loans. They were far from the only company to make this claim. The list of companies who applied for ATVM loans sent following Jalopnik's FOIA request is not a complete one. The document we were sent is from Sept. 2011, although Energy Department officials tell us they are in the process of compiling a more up-to-date one to comply with several records requests, including ours. It is possible that more companies have applied since then, but no new money has been handed out. Release of this information would result in competitive harm by informing competitors that these applicants submitted an application to the solicitation, but did not possess the required financial and/or technical merit to be granted an LPO loan guarantee. This fact would be a cause for concern among many lenders. Therefore, public disclosure of this information would result in a threat of injury to the applicants' future negotiation position in obtaining financing on favorable terms. An Energy Department official told Jalopnik that it is possible that the companies whose information is not redacted either consented to its release or did not respond to the government's queries as to whether they wanted that information withheld. It's also important to note that the majority of the companies listed here remain in business, but they tend to be manufacturers of parts, batteries, tires or other components. Most of the ones who sought to make whole cars weren't so lucky. There are some big names on the list, too. Chrysler asked for an $8.55 billion loan in November 2008, back when they were owned by Cerberus and in the throes of bankruptcy. They withdrew that application last year. General Motors also asked for $14.4 million, and they later withdrew their application as well. Some of the carmakers' presentations to the Energy Department can be found here. Supplier Magna asked for $40 million (which they did not get), and transmission maker BorgWarner asked for $27.60 million (which they did not get, either.) Additionally, electric motorcycle manufacturer Brammo asked for $45 million, and they were turned down as well. All of those companies are still around. Not all of the startups died, either. Local Motors, creators of the innovative open-source Rally Fighter, is still kicking after their $24.34 million request was turned down. Opposed-piston diesel engine manufacturer Eco Motors is still around and is now looking to do business in China. While Elio Motors didn't receive the $260 million they requested, they appear to be working toward production of their green three-wheeler as they work to secure funding from their local government. And ZAP is still around despite not receiving $200 million in loans, although considering their extremely shady history, that may or may not be a good thing. But now, let's look at the car companies that didn't make the cut (or in two cases, did) and later fizzled out. Perhaps it could be argued that they would have made it had they received government funds, but it's equally easy to argue that not funding them saved taxpayers a lot of money. Who they were: An Anderson, Indiana-based company that sought to build a fleet of plug-in hybrid light cargo vans. Their business model was lauded by several companies with big, gas-guzzling van fleets like Comcast and Frito-Lay. How much they asked for: $450 million in Dec. 2008. What happened to them: Unable to secure financing to build a factory and their vans, Bright closed their doors in February of last year, laying off their 60 employees. They blamed the Energy Department for their failure, saying officials strung them along for three years with promises of a loan that was never approved. Who they were: A California startup that sought to produce a sleek electric three-wheel car called the 2e that looked like something out of a Star Trek movie. (In part because it was.) Aptera aimed for the three-wheeler to get 100 miles on a single charge, and it apparently wasn't bad to drive. Car and Driver had nice words for their prototype. How much they asked for: $75 million in Dec. 2008, then $184 million in Feb. 2010. What happened to them: Aptera ran out of money before the car could reach production in 2010. As for the now-famous video of employees destroying the body shells, the company maintains that happened before they went under. Who they were: VPG was based out of Miami. They wanted to create a fleet of tough, body-on-frame vans and taxi cabs powered by either Ford 4.6-liter V8s or natural gas engines. Their vehicle, the MV-1, was wheelchair-accessible and thus meant to be ideal for taxi cab use and for disabled people. They were built by AM General at their former Hummer plant. How much they asked for: Redacted from our documents for some reason, but they received $50 million. They were the last company to be approved for a loan, which they requested in late Dec. 2008. What happened to them: As we reported a few weeks ago, VPG ceased operations and laid off its staff of about 100. They had produced about 2,500 vans since Sept. 2011, and many remain on the road. CEO John Walsh told the Detroit News that part of the problem was a backlog of vehicles ordered by state and local governments who have yet to take delivery of the vans, and that the company could be viable under a new owner. Who they were: One of the most ambitious and well-known attempts at a new car company in recent years, if perhaps on paper rather than in reality. Since 2003, Carbon Motors had promised law enforcement agencies across the country the E7 — a tough as nails sedan designed and built specifically for cop car duty with no compromises, unlike when existing cars are adapted into cruisers. They were to be powered by BMW turbodiesel engines, of which Carbon ordered more than 200,000. How much they asked for: $310 million in August 2009. They called the rejection a major setback because they claimed they were led to believe they would receive the loan. What happened to them: Carbon sort of mysteriously disappeared in April, vacating their Connersville, Indiana plant in the same ignominious way that one would skip out on a restaurant check. Late last year they said they were shifting their focus from the E7 to a high-tech SWAT van. In the end neither were made, which is a shame because the E7 was an impressive car, although as Jason said in April, it's hard to imagine small municipalities being able to take care of them properly and cheaply. Who they were: This is a story you probably know by now. Ex-Aston Martin design maven Henrik Fisker sought to build a uniquely stylish luxury plug-in hybrid sedan. The design was revolutionary, the reviews were not great, and the company was plagued with an Old Testament-esque set of problems like fires and hurricanes, as well as new ones like lawsuits. How much they asked for: Fisker requested and received a $529 million line of credit, which they applied for in Dec. 2008. They drew down about $192 million until they were cut off, possibly after the government knew they were missing their targets. 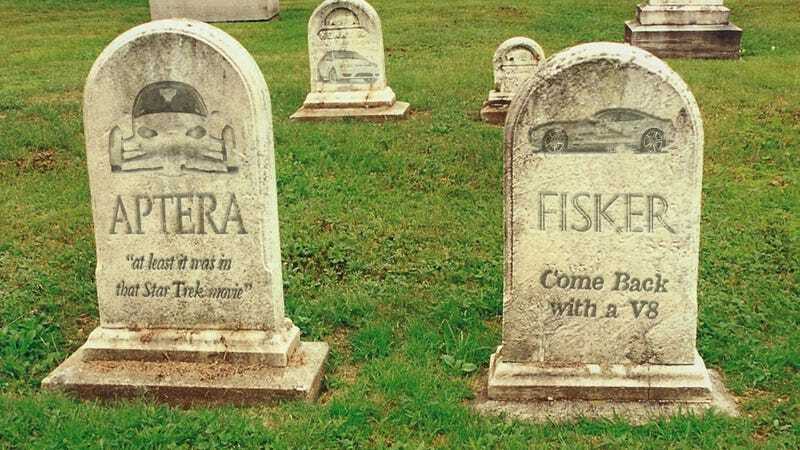 What happened to them: Fisker's future is extremely tenuous, and even though Henrik Fisker has left the company, that didn't stop Congress from calling him onto the carpet over the loan program. Bankruptcy seems to be inevitable, though a savior may come in the form of Maximum Bob Lutz, who seems inclined to stuff them with V8s. Who they were: Th!nk is a Norway-based company that has been trying to produce a small, Smart-esque electric city car since the early 1990s. They haven't been terribly successful at it, having filed for bankruptcy several times over their history. You have to admire them for not staying down, right? How much they asked for: $276 million in April 2009. What happened to them: Though several two- and four-seat City electrics were sold, the company encountered financial difficulties in late 2010 and filed for bankruptcy in mid-2011 after halting production. At nearly $37,000, small car had a tough time competing with the Nissan Leaf and Mitsubishi iMiev. However, given Th!nk's history, it's probably safe to assume we haven't seen the last of them. Who they were: Scrappy California startup Coda's sole product was a small electric sedan that was only for sale in their home state. After numerous delays, it was finally released last year at a somewhat-silly price of about $40,000, although only about 100 were sold. Though based in the U.S., the cars were mostly made in China, making them the first Chinese cars to go onsale here. How much they asked for: $526 million in June 2010. What happened to them: In December, Coda laid off a huge swath of their workforce, and filed for bankruptcy earlier this month. Who they were: V-Vehicle Co., later renamed Next Autoworks, had a significant amount of private capital from groups like Fisker-backer and venture capital giant Kleiner Perkins Caufield Byers, T. Boone Pickens and Google Ventures. Their goal was to build a small, efficient, spaceframe-based vehicle with plastic body panels in a former GM plant in Louisiana. Next Autoworks' roster of leaders included a former Ford executive as well as Mazda Miata designer Tom Matano, although the company was known for being secretive and vague when describing their actual product. The state pledged $67 million back in 2009 on the condition that the company get approved for their ATVM loan. They reportedly withdrew their application for that loan after learning they would be turned down. How much they asked for: $340 million in May 2010. What happened to them: Failure to secure the ATVM loan meant Next had to scale back their plans and put their factory on hold. Despite their strong political connections, Next appears to have disappeared today. The company has since closed their San Diego headquarters and Michigan technical center. Who they were: Two San Francisco companies started by Scott Douglas Redmond, a serial tech entrepreneur with a history of unrealistic projects that go nowhere. XP claimed they could build an electric car made out of an inflatable polymer material, and Limnia was to be their battery manufacturer. Whether XP could have actually produced this car is extremely debatable. Unlike most of the other cars on this list, XP never showed off a prototype or concept car, though the reason for this listed on their website is that "a prototype car has nothing whatsoever to do, in any way, shape or form, with a volume production car" and "To suggest otherwise is the height of naiveté and is only suggested by the most unsophisticated members of the public, or competitor cyber-bullies." How much they asked for: XP sought $40 million, and Limnia sought $15 million in Feb. 2009. What happened to them: With their loan requests turned down, the companies sued the federal government, seeking a combined $675 million and alleging political bias led to Tesla and Fisker getting loans over them. The lawsuit continues to move through the federal courts. Who they were: If you somehow recognized the red car above as a Mahindra Reva, you have a good eye. That's the Indian car that Long Island-based Bannon Automotive sought to build and sell in the U.S. The cars were to have a range of 120 miles on a single charge and cost between $17,000 and $25,000. It didn't pan out. How much they asked for: $40 million in April 2009. What happened to them: The deal with Mahindra stalled out in 2010, leading Bannon to file a lawsuit claiming that the Indian company reneged on their agreement. That was settled in early 2012, but the settlement did not include a provision to build the cars. Bannon appears to be no more. What do you think? Was the ATVM program responsible or should it have funded some of the cars on this list? And should governments do this at all?